Keat’s thoughts on beauty and truth allow the artist to have a transformative effect through their work and allow the artist himself to participate more fully in the drama of the human condition. Can something be beautiful that does not also contain something true inherently residing in it? And can something which is true not also have a certain beauty within it? Are they not inherently linked? When we see beauty are we not compelled inwardly to find out all there is to know about it? For me, there is an undeniable beauty contained in the human form and I am compelled to pursue any knowledge that will increase my understanding, on many levels, of this form, ie- anatomy, human psychology, art history. This pursuit has increased my ability to love and appreciate this beauty of form. It has also increased my desire to capture such form and to recognize the unfathomable aspect of beauty. This need to know or make it conscious, in addition to an appreciation of beauty, allows a dynamic and procreative relationship to develop. It leads to one’s own transformation as well as allowing the knower the ability to carry that transformation to others. The artist/ poet through the expression of his work carries that transformative force to others and in the process creates an attraction to the beautiful. It is why we are so drawn to artists and their lives. We desire to be like them. Davies points out that “this different, gnostic, direct knowledge is knowledge of the human situation, and particularly a taste of its meaning and quality.” ( Ibid., p.151) Beauty informs who we are to our very depths and allows one a true participation in the human condition. What a beautiful drawing Judith. What you wrote about pursing knowledge of the human form and this increasing your appreciation and desire to capture the form has been has been my experience also. 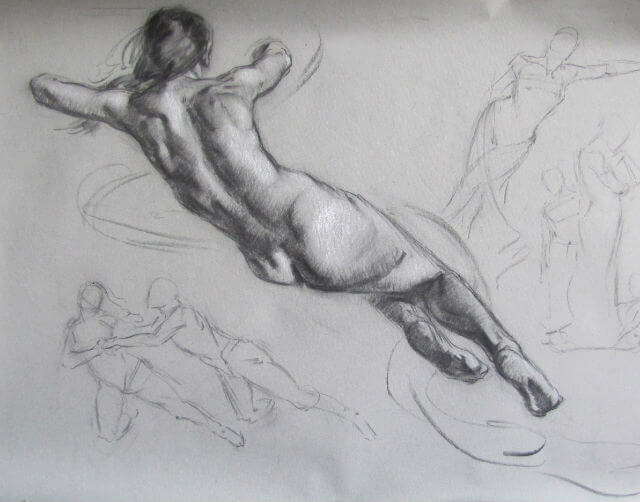 There are so many kinds of beauty but the human form has captured me from the earliest life classes I took. Sometimes I wish it did’nt but seeing a drawing like the one on this blog inspires me.